Syncope is common in all age groups, and it affects 40% of people during their lifetime, usually described as a "faint" or "blackout". Cardiac syncope as a result of arrhythmias or structural cardiopulmonary disease is more common with increasing age. Cardiac syncope is associated with increased mortality and must be excluded. Brain imaging, carotid Doppler ultrasound, electroencephalography, and chest radiography are often not needed in patients with syncope. An approach to the evaluation and management of syncope in adults. BMJ 2010;340:c880. 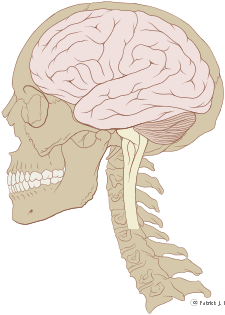 Image source: Illustration of the human brain and skull. Wikipedia, Patrick J. Lynch, medical illustrator, Creative Commons Attribution 2.5 License 2006.